Malaysia Property News | Property Market In Malaysia: KL land price too high? KL land price too high? 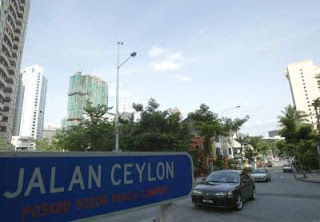 The piece of land, which is located at the intersection of Jalan Bukit Ceylon and Jalan Ceylon, is situated on a hilly area. KUALA LUMPUR: The three parcels of freehold land along Jalan Bukit Ceylon, Kuala Lumpur that was recently put up for sale are priced on the high side, property professionals said. Last week, advertisements appeared for the sale by tender of three parcels totalling 36,563 sq ft with a reserve price of RM26mil, or about RM700 psf. “On an as-is' basis, this is quite high. I would reckon a price of RM500-RM550 is more realistic considering its residential use status,” a valuer said. Sources familiar with the sale said interested parties have to pay more if they were to convert it for commercial use. “Commercial status fees can vary and it depends on a case to case basis by the authorities. It could be that after conversion, the cost of this piece of land may rise up to RM1,500 psf or more, which further adds to the costs of development,” sources said. “If you are a developer, you must ask yourself whether you will be able to make a profitable sum,” he said. However, a valuer said RM700 seems fair and the residential status was a non-issue. “A developer can still build residential units and owners will not have to pay commercial rates for utilities. Although it may not be close to rail links, it is located in the city,” said a source. StarBiz understands that the piece of land, which is located at the intersection of Jalan Bukit Ceylon and Jalan Ceylon, is situated on a hilly area and prospective developers who may be eyeing the piece of land will need to carry out additional levelling works, which will further add to the costs of development. “I would reckon a 20% margin is comfortable before developers actually decide to do this (carry out development work). “Ground works will definitely add a substantial amount to the costs as well,” a developer said. Another property consultant used the example of a piece of prime freehold land measuring 50,063 square feet located in nearby Jalan Tengah, which is just next to Eastern & Oriental group's St Mary's Residences. This piece of land is being transacted at about RM100mil, which prices it close to RM2,000 psf. However, this piece of land has a commercial status, which does not require any additional costs for conversion. It is also located in a relatively more centralised area nearer to public transport facilities.